Whether they be viewed as polemical or pragmatic, this latest in the tradition of creative urban camouflage is at least entertaining and arguably even practical. Artist Aya Tsukioka drew inspiration both from the contemporary Japanese cultural infatuation with oddities and blended it with the ancient Japanese disguising notions of the ninja. 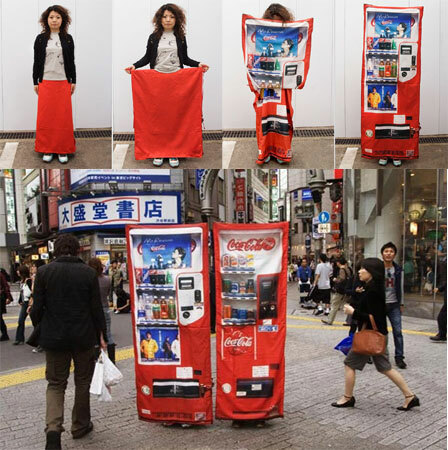 Designed for adults, this amazing urban camouflage soda machine costume unfolds from a simple red skirt. It may not be enough to fool attackers, but perhaps it would work in a crowded downtown with lights, images and other commercial urban artifacts. 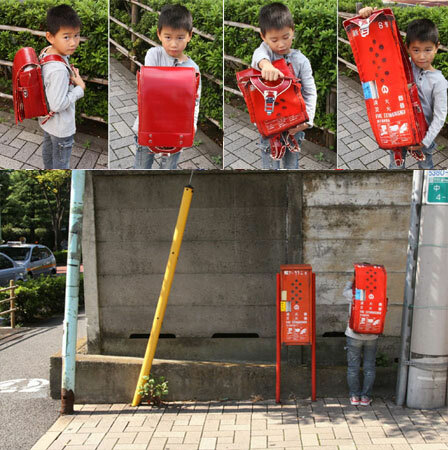 The child’s alternative to soda machine camouflage is a useful backpack that doubles as a typical Japanese fire hydrant. While these designs might not be entirely useful in a strict sense, they are at least ingenious and playfully relevant to Japanese pop culture. They also serve to raise awareness about the overall increased concern for personal security in Japan. 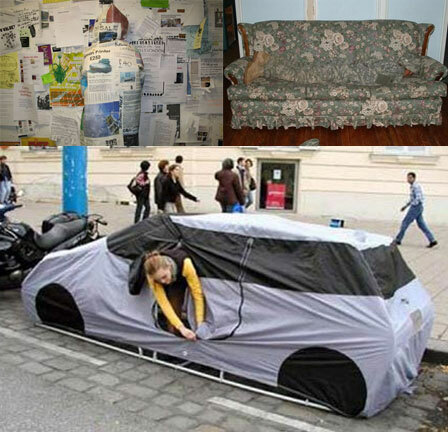 Other examples of interesting urban camouflage include this hooded sweatshirt designed to blend into bulletin boards, the humorously titled couchmouflage and the bizarre car tent designed for urban camping. Know of any other examples? Add them below! Also be sure to check out this strange video depicting urban camouflage in action. Graphic Remix: Soda Can Designs That Shake It Up!